The Google Docs Presentation is well-suited for use as a starting point for short student driven research projects because of the availability of efficient integrated research tools right on the page. To introduce students and teachers to the built in features, I created a simple template to guide the learning and help everyone discover the usefulness of the tool. The planner can be used with any content. Just associate a learning goal with the template and it’s ready for use. Built in tutorials allow students to explore the tools at their own pace. 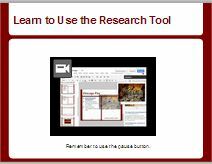 The activity provides opportunities for teachers to help students fine tune their search skills as they engage in the research. Of course, this is a template so it can be modified. Start with a simple learning goal the first time you use the template to ensure student success. To encourage collaboration, divide students into groups, have one group member pick up the template and ask that student to Share the copy of the document with others in the group. Teach students to use the Comments feature to collaborate and provide feedback to other group members. You must be signed in to Gmail before you can pickup your own copy of this template. Choose Use This Template and a copy will be added to your own list of Google Docs. Feel free to edit and modify. Create a new document or modify an existing one. Add your content and save. Go to your list of Google Docs. Choose Create New > From Template . On the new screen that appears, choose Submit a Template. Complete the form with information about your template and submit. The template will become available in the gallery in a few minutes. Choose Preview to grab the link to publish so students can pick up your template.